Whilst many premium tyres designed for sports cars leave comfort until last, the comfort was part of the design brief given to the engineers when coming up with the Pirelli P Zero Rosso N0. This edition of the hugely successful P Zero Rosso N0 has been produced in assocation with Porsche who have endorsed and approved the P Zero Rosso N0 for use on some Porsche models, aiming to optimise perfomance of both the car and tyre. An ultra high performance designed to be used on some of the most premium cars in the market. The Pirelli P Zero Rosso is available in both directional design for fitting on front axels and asymettric for rear axels. 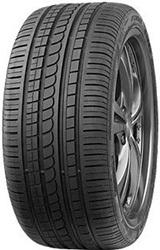 This is a high end tyre designed for use with modern sports cars, encompassing directional tread patterns in order to ensure maximum grip on all surfaces in all conditions.This edition of the hugely successful P Zero Rosso N0 has been produced in assocation with Porsche who have endorsed and approved the P Zero Rosso N0 for use on some Porsche models, aiming to optimise perfomance of both the car and tyre. The Pirelli P Zero Rosso is available in both directional design for fitting on front axels and asymettric for rear axels. This is a high end tyre designed for use with modern sports cars, encompassing directional tread patterns in order to ensure maximum grip on all surfaces in all conditions. Whilst many premium tyres designed for sports cars leave comfort until last, the comfort was part of the design brief given to the engineers when coming up with the Pirelli P Zero Rosso N0.Despite the incredible comfort and handling afforded to the P Zero Rosso range, perfomance in both wet and dry conditions remains unsacrificed, using wide outside continuous grooves that wrap around the tyre to ensure rapid dispersion of water and give maximum resistance to aquaplaning. Used as original equipment on over 200 vehicles including, Audi's, Bentley's, Ferrari, Mercedes and Masarati, the Pirelli P Zero Rosso is a truely great perfomance tyre.This edition of the hugely successful P Zero Rosso N0 has been produced in assocation with Porsche who have endorsed and approved the P Zero Rosso N0 for use on some Porsche models, aiming to optimise perfomance of both the car and tyre.